If there is anyone out there who has read any of the posts to this blog, or been a follower of my tweets etc. 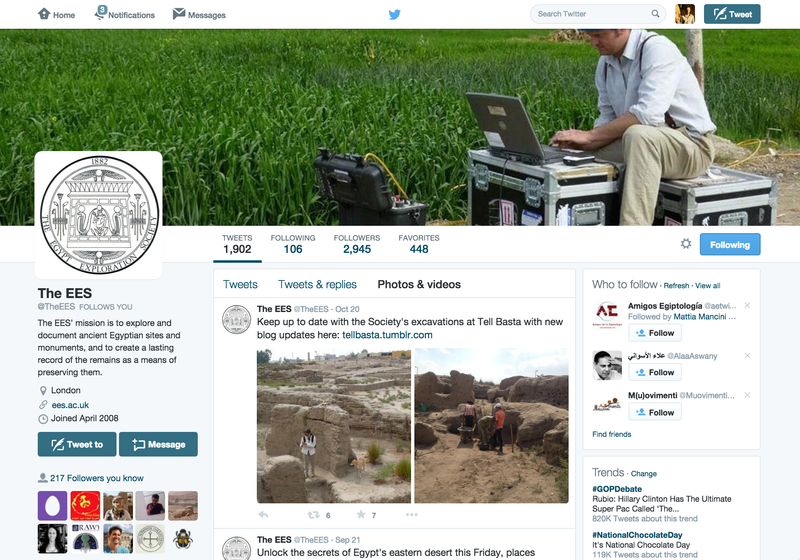 they will probably be aware that I have a particular interest in the way archaeology and Egyptology are communicated. 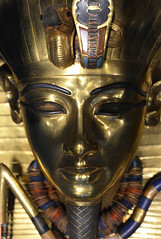 I’ve probably said this before but information and communication are the very essences of archaeology and Egyptology. Aside from the preservation of the physical remains – the curation of objects in museums or the conservation and protection of sites – just about everything else, from the moment the spade goes into the ground, is about gathering information, then documenting, interpreting and communicating it. Communication can take many forms. There are many different media, all suited to different purposes. The most familiar to academics – as both creators and consumers – would probably include scholarly articles and monographs, and lectures. The wider public, meanwhile are probably more familiar with television and radio programmes, magazine and newspaper articles, exhibitions, and, these days, the internet and social media. 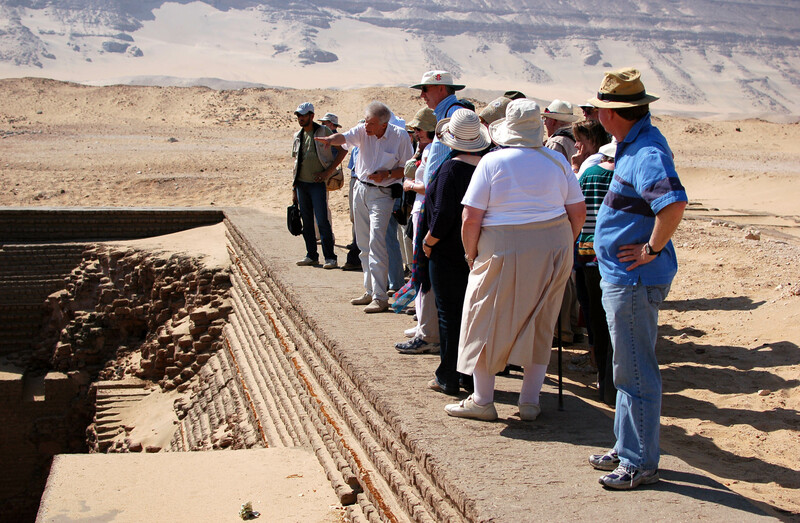 Archaeologists and Egyptologists are the gatherers, interpreters and communicators of the information. Readers, viewers, listeners, surfers of the net are the consumers. One of the essences of the EES’ work is to provide a bridge between scholars and the wider public. This has led us, in recent years in particular, to try to embrace as wide a range of these media as possible. I have dabbled in a number of them myself. While our primary means of communication, particularly when it comes to the research the Society itself supports, remain lectures and scholarly print publications, we have made extensive use of online, particularly social, media, and communicating this way is now firmly embedded within the activities of the staff team. Years ago, when I first started wondering how we (EES) could improve our online presence, I had initially thought that what we need was a flashier website, perhaps one of those blogs I’d heard about, and an electronic newsletter. The big institutions had that kind of thing, and we should too, I thought. Something I hadn’t realized immediately, but that quickly became apparent, was that we would need to have a think, not just about the means of conveying the messages, but what messages we would need to have in the first place. Initially, I found it very difficult to think about what ‘news’ we might have for people. There were two reasons for this: First, up that point, our ‘news’ had been generated according to a print schedule. Printing and mailing journals, magazines, leaflets etc. is expensive so we didn’t do it very often and we weren’t therefore reporting anything more regularly than twice a year, and in between times we didn’t really think about it at all. 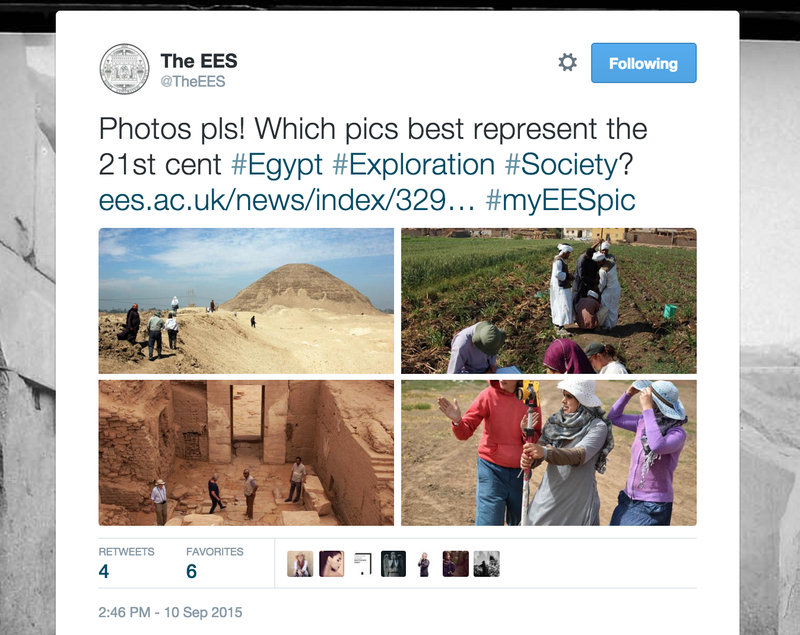 Second, most of our news focused on our fieldwork, and other developments elsewhere in professional Egyptology – this is what the Journal, the magazine and our lecture series were for after all. And historically, the work of the office staff had always been kept in the background. Initially, I thought, ‘sh*t, we in the office don’t do anything…’ but then I began to realize that that wasn’t true, and there was quite a lot going on in the office which I thought might be of interest to people, but which we didn’t really talk about. Most obviously, it seemed to me that the Society’s archive was an unexploited treasure trove of interesting material and activity, with the added benefit that it was on hand for staff and much easier for our members to visit than our fieldwork projects. But more generally, I realized that we were doing things that might be of interest. 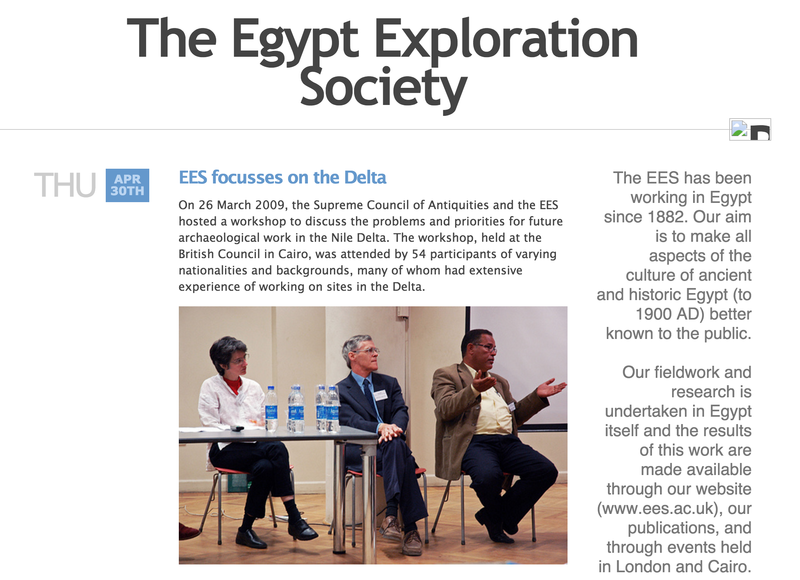 In the first few months after establishing a new ‘news page’ for our website we had reported on the project to gather new information and information images for a new edition of Who Was Who in Egyptology, the award of a medal for the Society’s participation in the UNESCO rescue campaign in Nubia, the gathering in Cairo of specialists for the first EES/MSA Delta workshop and a members’ trip to the Gilf Kebir. All of this, I like to think, showed the Society to be much busier and active than previously; it showed that we were doing much more work than perhaps anyone would have realized previously. No bad thing. Another important aspect of this, I think, is transparency. One of the defining aspects of the internet revolution has been in the voice we use to communicate. It’s much less formal than it used to be, much more personal and personable, more human, friendly, even. This has brought with it a shift away from the passive voice, of the faceless institution – ‘it has been agreed…’ etc. – to the active first person plural ‘we have agreed’, and eventually ‘I’ as in ‘I believe…’ etc. I talked about this in my first blog post as EES Director. Social networks and blogging demand this. There are of course accounts set up for institutions – we at the EES have them – but individual voices are often very evident, and many institutional accounts are often explicit in saying exactly which individuals are responsible for posting to them. I think this is all a very good thing. I sense that audiences want to get to know the people doing the work they read about. The EES is an organisation of people, and we have worked hard to make sure those people’s faces and voices are familiar to our audience. It helps us to engender a spirit of participation, involvement, and that is very important. As I mentioned above, one of the challenges for us is in trying to convey the archaeological work the Society supports to the wider public. As well as creating the means for those of us at Doughty Mews to communicate via social media and encouraging the staff team to think constantly about which our activities are newsworthy, I have also tried to extend this practice to the our teams in the field. We’ve had a lot of success with this but there’s still room for improvement perhaps. The Society provides financial and other assistance to almost twenty projects in Egypt now. 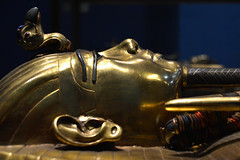 We can only do that thanks the generous support of our members,* most of whom are ordinary members of the public with an interest in ancient Egypt. We depend on them for almost all the funding we have to keep the operation going, and it is therefore vital that we are able to show them what we are able to do with that money in order to keep the subscriptions and donations coming. It’s a long time ago now that the Society’s Trustees accepted that we couldn’t afford not to have a presence on social media, given the number of people using Facebook, Twitter and the rest (one billion unique users in a single day on Facebook recently…). The pact between the Society and its archaeologists which requires that regular scientific reports are submitted for publication if funding is to continue, is also long established. I wonder how long it will be before we are no longer able to accept that any one of our teams ‘does not do social networks’. Most of the Society’s longer established teams do now have a presence on social media, most obviously the series of ‘blogs’ we have set up using Tumblr as a platform, although they are more like ‘dig diaries’ than blogs – which seem to me more for personal views and opinions – at the moment. These have been great: regular photographs have given us all an idea of the setting for and the people involved in the work. I feel I really know the, previously unfamiliar, Delta sites that Jo Rowland or Pat and Jeff Spencer have been working in over the years as a result. They also convey a sense of the work in progress, and of the way information is gathered and a picture of an ancient site, people, or ways of life is built up over the course of a season, in a way that an end-of-season report cannot. Again this is about a sense of involvement. Many of our members have told us that they would have liked to have been archaeologists themselves; there’s no possibility for them to work on an archaeological site in Egypt – a dream for so many people of course – but being able to support the work of our teams, and to feel that sense of involvement, is the next best thing. A vision for the next few years / the perfect online excavation? Our subject and photography go together perfectly. 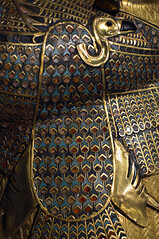 It’s no coincidence that Egypt was the setting for one of the first great photographic expeditions, that of Francis Frith in 1856; the light in the country is fabulous, the monuments and artistic canons are bold and exotic (to the western mind at least), and in any case a photograph conveys so much more than a description or even a drawing can. In fact they are often all that’s needed – just a photo and a short caption. We’ve been asking the online community to send us the photos that they think best represent the EES in the 21st century lately, using the hash-tag #MyEESPic. More info here. Twitter and Instagram are perfect for this kind of thing. Twitter imposes limits on the number of characters available (140) so you have to be very concise in what you say; this is a constraint but it can also be useful – it helps focus the mind on what you really need to say, and this also makes posting quick and easy. And there’s no limit to the number of posts you can upload of course, if you have a lot more to say. 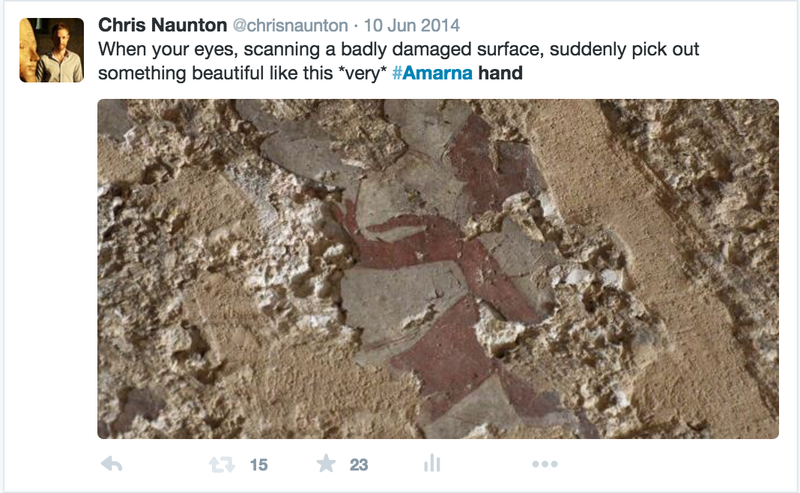 The British Museum’s Amara West team (including project director, Neal Spencer) has made excellent use of photos as a quick and easy way to show what they’re doing. Both Twitter and Instagram offer huge potential audiences, of people who want to consume content of exactly this kind: quick, easy and very visual. These are people who may simply not want to read longer pieces, who, in other words, would be lost to us if we weren’t embracing these media. The other thing that Twitter in particular does very well is to provide ‘headlines’ or ‘teasers’ leading to further information through hyperlinks. Twitter is a brilliantly effective way of sifting quickly through the information-overload for the things you want to learn more about, a bit like flicking quickly through the entire newspaper then turning back to spend more time on the stories you really want to read. I would suggest that those archaeologists who simply don’t want to write in 140-character text-speak, should nonetheless be using Twitter to post links to their longer pieces, because for many people Twitter is the best, if not the only, source of information about such things. Some Twitter accounts are nothing but aggregators and redistributors of content from elsewhere. Some of the best for our subject are ‘Talking Pyramids‘ and @SusanLlewellyn (an EES Trustee!). There are multiple social networks of course and some might be put off by the need to keep them all up-to-date. The simple way around this is simply to have your accounts set up so that they automatically post content to all your pages. I have accumulated 2,000 followers on my professional (as opposed to my separate, personal) Facebook page in the last 8 months or so, and yet I barely ever post anything directly to it – almost everything I do is posted to Twitter and automatically also appears on Facebook. 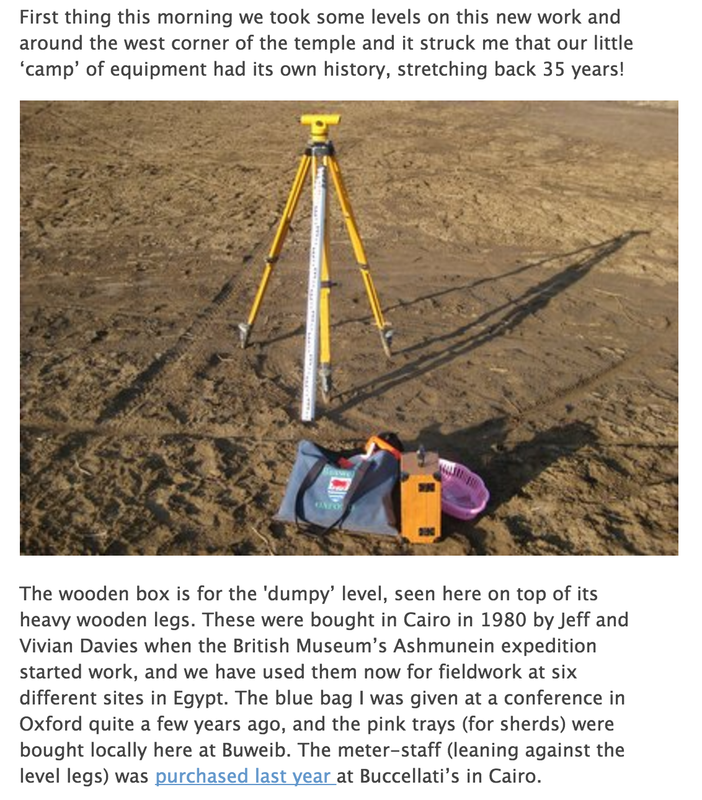 Some of my favourite archaeological blogs are those that give you a sense not just of the subject matter but of the process; not just the archaeological material, but the people uncovering it and how they went about it, and also what it’s like to work on an excavation in Egypt. I was really struck the first few times I joined such projects that the experience was not just about the archaeology, but at least as much about where we lived, the food, the journey to work, the people we worked with, the Arabic words and phrases you pick up – none of which is available in the reports I had read up to that point (and which made up most of the EES’ output about its work until a few years ago). Most of our teams have got to grips with this very well now – recent favourite posts of mine include Pat Spencer’s on the Delta Survey team kit (which reminds me of the ‘what’s in your bag’ meme), Jo Rowland walking the dog in Shibin el-Kom, and the eating of cakes during the Theban Harbours and Waterscapes Survey Project. None of this means we should exclude the archaeology however, and this should remain the main theme. We at the EES have to be a bit careful here as the Egyptian Ministry of Antiquities requires that it be notified of new ‘discoveries’ before they are announced, however this generally means the more sensational finds of the kind that interest the media , not the every-day material. 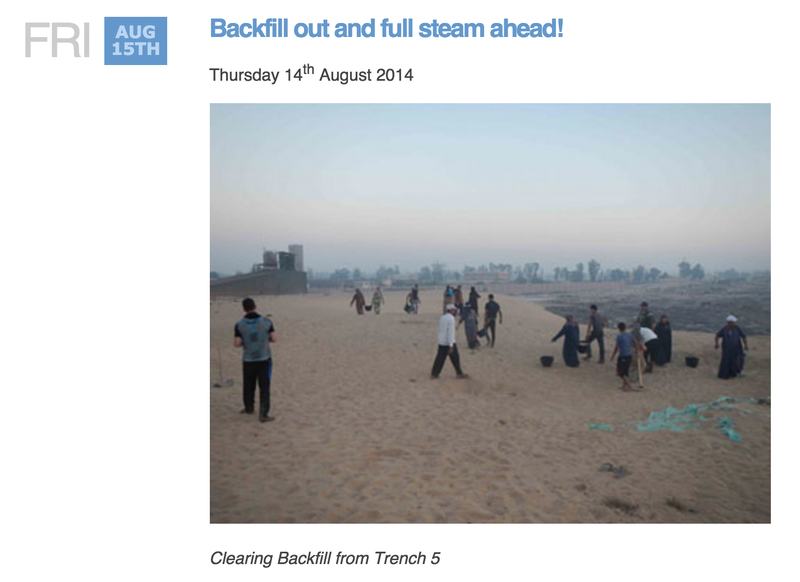 The best blogs are those that convey a sense of the story of the site unfolding. 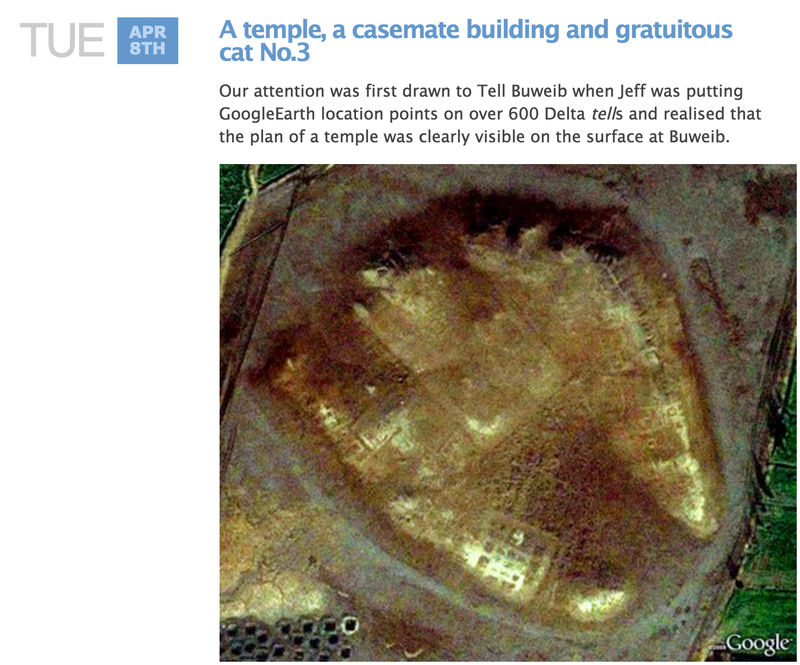 Pat Spencer’s account of the Delta Survey’s investigation of the temple at Tell Buweib is a good example. 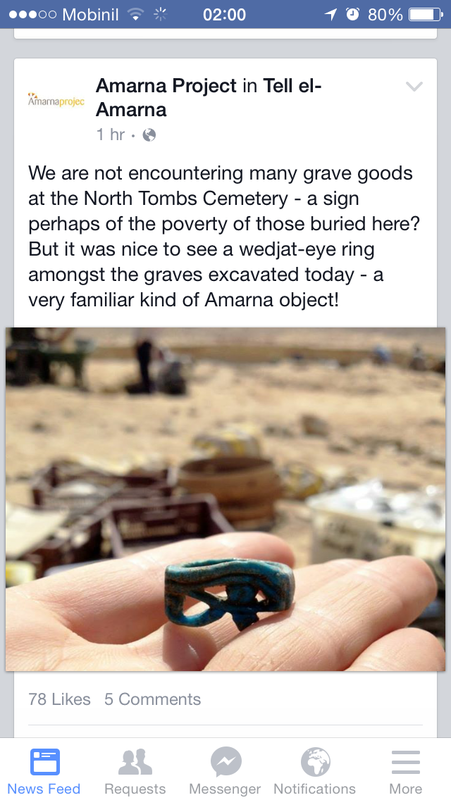 The Facebook page for the Amarna Project, and iMalqata and Amara West blogs are excellent. Notably in both these last two cases, the blogs are authored by different team members from one post to the next, providing different perspectives and different voices, but very explicitly. Get involved – come to lectures, support or work etc. I’d also like to see some of the EES’ blogs linking more to content elsewhere. As I said above most of them function diary-style, day-by-day accounts and all are inactive outside the field season. All field projects have a life outside the fieldwork however. I’d like to see more accounts also providing links to reports on previous seasons (Penny Wilson’s page on the work at Sais is very good for this) further reading, other complementary work, and opportunities for people to engage with the work such as notices about public lectures, and the occasional note encouraging readers to support the work would also be very worthwhile; again engendering that idea of involvement is very important, especially if it leads to an increase in financial support! There is a skill to all this; I’m not suggesting that everyone will be good at it. 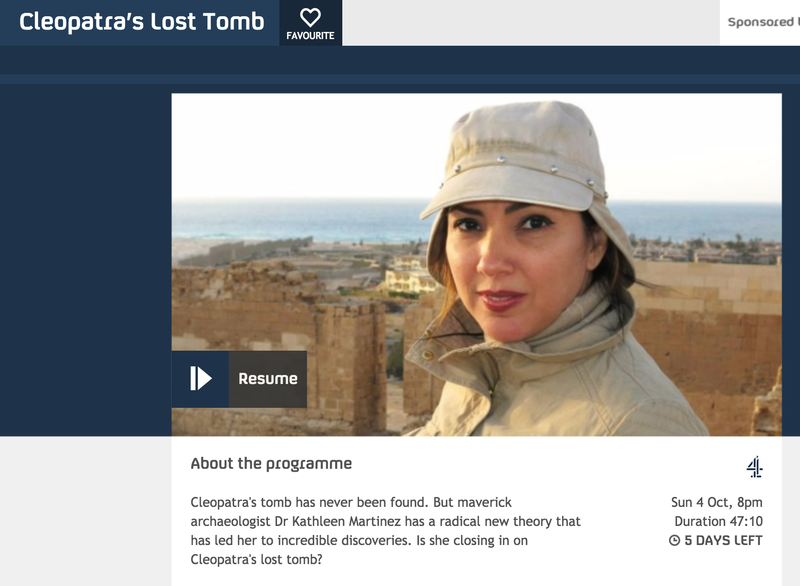 This reminds me that around fifteen years ago when archaeologists were only just beginning to become aware of the internet and long before Facebook and Twitter were created, the Amarna Royal Tombs Project recruited a journalist, the much-missed Paul Sussman, specifically for the purposes of communicating with a public audience online. I think it’s a shame that this hasn’t been taken up by more archaeological projects since. In the same way that I think it’s a shame that John Pendlebury and his team’s efforts to capture life on excavation – which continue to fascinate us all over eighty years later – weren’t repeated. I think archaeology would be better off if these examples were followed! If you’re not already an EES member, please consider helping to support our vital archaeological work by joining (see here) – we’d be delighted to welcome you!